Trimble announced today the release of Trimble® Scan Explorer Extension for SketchUp Pro; a powerful, easy-to-use tool enabling architects, engineers and geospatial professionals to create models from 3D scanning data. The new solution connects the high-resolution field data from Trimble scanners with intuitive and powerful professional modeling software; simplifying the process of creating, accessing and sharing precise 3D models of the real-world environment. The Trimble Scan Explorer Extension dramatically reduces the time required to generate a SketchUp Pro 3D model from scan data. Streamlined tools and one-touch features allow users to quickly extract construction points and lines that are used as a guide to simplify and expedite the modeling process. Automated plane extraction tools further increase modeling efficiency, particularly when modeling building interiors and facades. For improved visual references when working with point clouds, the extension includes a simple-to-use edge extraction tool, allowing users to easily decipher important cues from the scan data directly into their model building space. Structural edges are brought into SketchUp as guidelines, and one button push displays the shell of the structure. "By seamlessly integrating powerful tools across our broad range of best-in-class solutions, Trimble is helping transform the way our customers work and accomplish more every day. The integrated workflow provided by Scan Explorer brings the accessibility of 3D modeling to more users for as-built analysis and design changes," said Alain Samaha, business area director of GIS and Software for Trimble's Geospatial Division. "Professionals can now easily create visual 3D models that provide a true representation of the environment they are working in—improving the communication, collaboration and quality of deliverable that they can provide to their clients." "SketchUp's enormous popularity as a design tool is rooted in its capacity to make many complex processes easier and more efficient," said Chris Keating, director of the Architecture Division within Trimble Buildings Group. 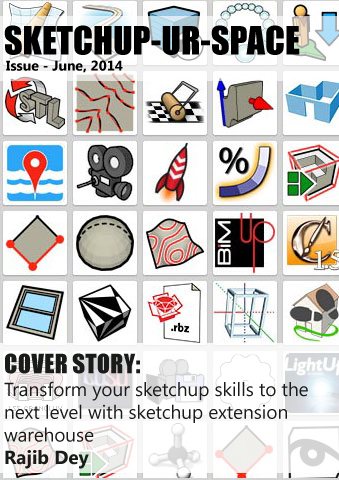 "The Trimble Scan Explorer Extension for SketchUp Pro reinforces our mission to deliver SketchUp?s benefits to new users and for new uses." The release was announced today at SPAR International 2014, the leading conference for 3D data capture, processing and delivery technologies. Availability: Trimble Scan Explorer Extension for SketchUp Pro is available through Trimble's Geospatial distribution network and online at: http://infogeospatial.trimble.com/Trimble-Scan-Explorer-SketchUp-Extension.html.